Here we are to the west of the market place, along the road which would eventually take us to the Midlands if we let it. 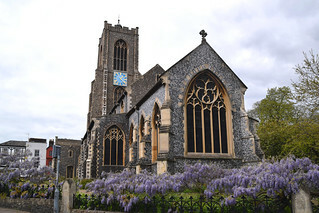 Now, Norwich is not short of large, urban churches, but St Giles is a little different to the others in that it is almost entirely the work of the 14th century, and is thus late Decorated in character rather than Perpendicular. 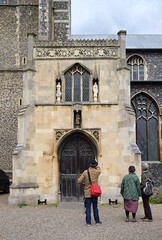 The porch and chancel are later, contemporary with the other great city centre churches that industrial wealth provided on the eve of the Reformation, but given that the bulk of St Giles is earlier than these other churches, it is interesting to note that it stands on the highest point within the old city walls, and its tower is the tallest of any Norwich city church. 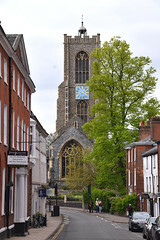 This tower was intended to be seen from afar, and so from the start it is obvious to us that St Giles was planned to be an important church. Today, it is often known picturesquely as St Giles-on-the-Hill. And still today St Giles forms an important part of the townscape. 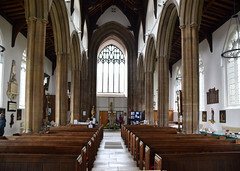 The nave floor is at the same height above sea level as the famous roof bosses of the Anglican cathedral, but it is the catholic cathedral that St Giles sits close to, and in the absence of any other towers in the immediate vicinity, Giles performs a counterpoint to great block of a tower of Scott's fabulous building. This may well have been intended by Scott when he designed it, although of course he could never have imagine that the two would one day be doing their dance from either side of the sunken inner ring road. 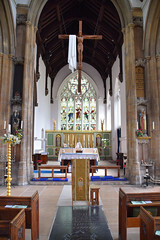 Diocesan architect Richard Phipson was responsible for the considerable restoration here at St Giles, rebuilding the chancel completely in the style of the rest of the church, replacing at last the former chancel which had been demolished in the late 16th century. Late medieval money brought a great stone south porch, which appears fortress-like against the earlier flintwork and tracery behind it. And perhaps not inappropriately so, for here I must make a moan that, in common with several other of the city centre's working churches, St Giles is usually kept locked. 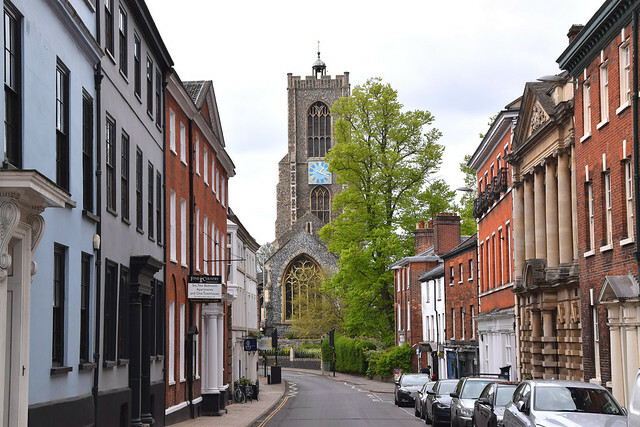 Such a state of affairs would not be allowed in the centre of Cambridge or Ipswich, and so it is a shame that the diocese allows it here. The interior is almost entirely Phipson's work, a Victorian church within a medieval shell, but what a shell it is. The great fluted columns rise into dimness as if one were walking through a great forest. 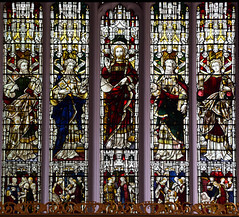 Inevitably, there is a similar feel to Phipson's St Mary le Tower in Ipswich which retains similar arcades, except for the great blessing here that most of the coloured glass in the nave is gone, and St Giles is filled with light. 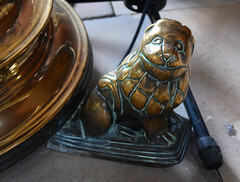 Pevsner records that the restoration cost five thousand pounds, about a million in today's money, which likely included the cost of rebuilding the chancel as well. 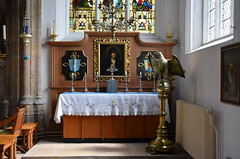 The furnishings are a quiet counterpoint to the colours of the Anglo-catholic fixtures and fittings, a liturgical tradition which St Giles maintains, and which has benefited from acquisitions from other Norwich churches as they became redundant. 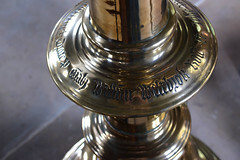 There are earlier survivals, including medieval brasses, the best of which are two pairs to two couples, the Perdaunces and the Baxters, both from the 15th century, and a chalice brass to a former Priest. 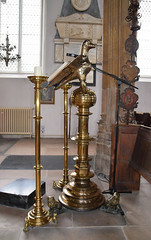 Best of all, there is one of those enormous 15th century East Anglian latten lecterns, an eagle supported by little lions at the feet and a dedicatory inscription of 1493. 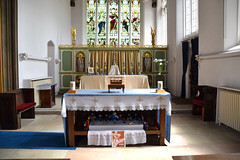 Nick Groves tells me that it is the one that used to be in St Gregory, and before that in St Michael Coslany. 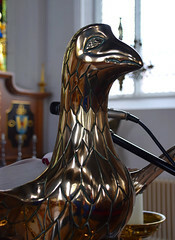 Nick also recalls a story from the same decade that the lectern was made. 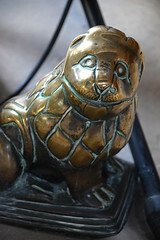 One John Colton was lost in a storm outside the city, but was saved by following the sound of the curfew bell being rung from the tower of St Giles. 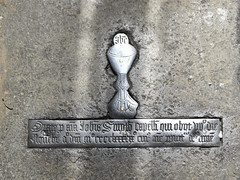 In gratitude he bequeathed a parcel of land, but also left a small bequest for the curfew bell be rung from St Giles' tower in perpetuity. This request is still honoured every evening, an unusual example of an instruction from before the reformation still being carried out. 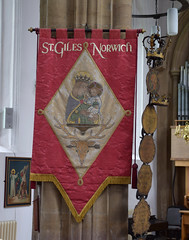 The Norwich city churches tend to wear their mayoral mace and sword rests like trophies, a reminder of the Mayors provided by the parish over the centuries. 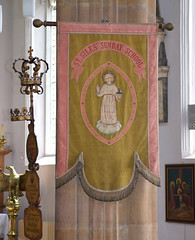 St Giles is no exception, having no less than five sets of them. 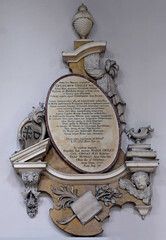 And another reminder of the civic importance of St Giles is the large number of generally very good memorials to past worthies, especially of the 18th and 19th century. But I am making it sound a stuffy, antiquarian place, and it is not. 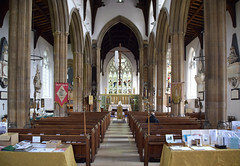 Rather, St Giles has the feel of a living church, and the occasions on which I've visited I've always found it warmly welcoming - at least, when I've managed to get inside.